Someone once asked me what kind of wine I liked. I answered that I didn’t care about the label, but that I loved a lusty, obnoxious red. I find that I’m pretty much like that when it comes to most food and drink. When perusing pasta on a menu, my eyes don’t even rest on Alfredo, they’re seeking arrabbatia or, better yet, puttanesca done right. I’ve got to have some heat or other assertive flavors in much of my food. But, that’s just me and my cast-iron palate. When it comes to serving guests, I have to keep their palates in mind. Tomorrow evening, I’m having some people over for drinks and appetizers. And I don’t really know all of their tastes, so I’m going to keep the foods fairly tame. But, I’m not going to give my flavors a lobotomy or any such thing. For instance, I’m serving hummus, but not a fiery version I love. 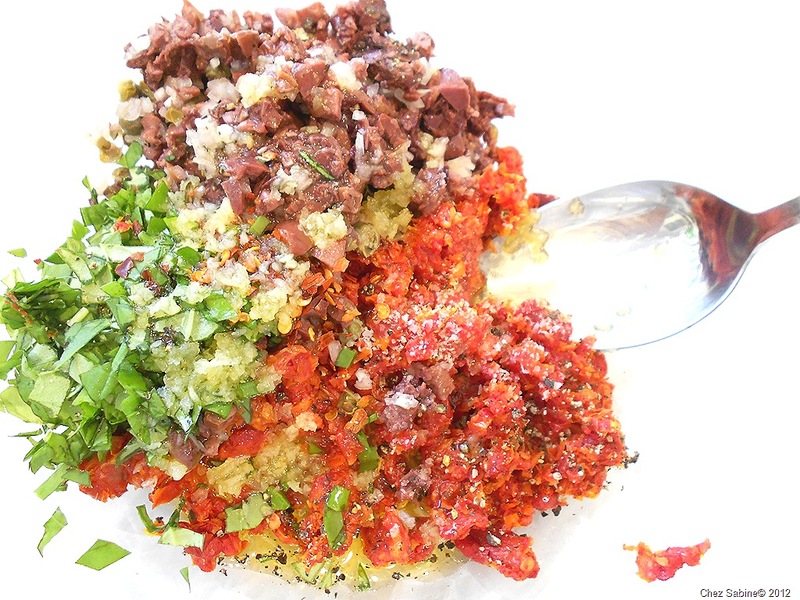 Rather, I’m taking the plain route but I’m accompanying it with a fragrant, flavor powerhouse in the form of sun-dried tomato-and-olive tapenade. However, fire will be represented because I cannot make a mild version of my killer salsa. I don’t see the point. But, back to the tapenade. This spread hails from Provence and comes from the Provençal word for capers. The classic version doesn’t use sun-dried tomatoes, but they lend themselves perfectly to this rustic, aromatic condiment. 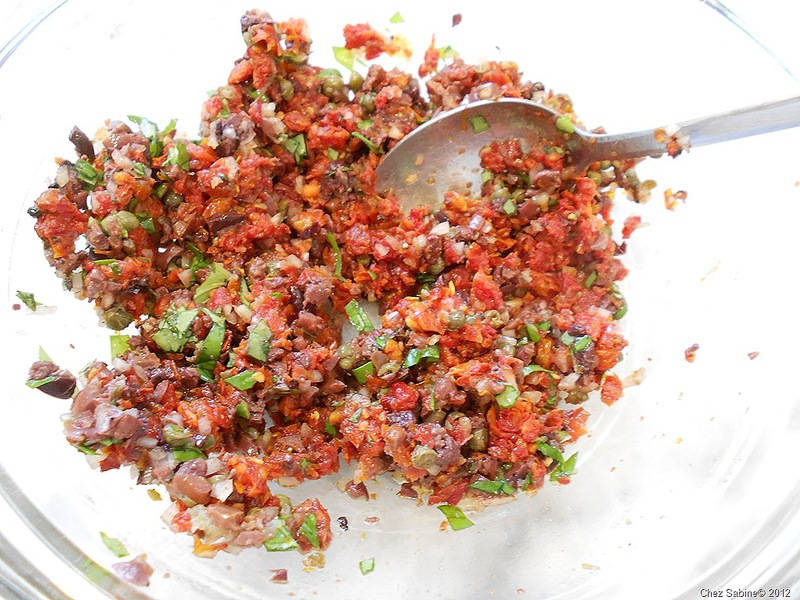 And this is such an easy and versatile tapenade. You can make it even easier on yourself by using a blender or food processor, but when I’m just making a small amount, I like chopping everything by hand, and I don’t always want it pureed. For hummus or crostini or even as a base for grilled pizza, I prefer it with some texture. But that’s up to you. One of the many wonderful things about tapenade is that you can really make it your own once you get the basics down. But I will insist on one very important point that I’d rather you not deviate from. I beseech, beg and implore you to please not use sun-dried tomatoes that come packed in oil. They’re, well, oily. And I like to control the amount of oil I use as well as the quality. And all of that oil that’s been sucked up by the dried tomatoes’ flesh tends to keep the sweet tomato flavor from shining through. And it’s got to shine through because it’s up against some heavy hitters, flavor wise, including kalamata olives, garlic, shallots and basil. 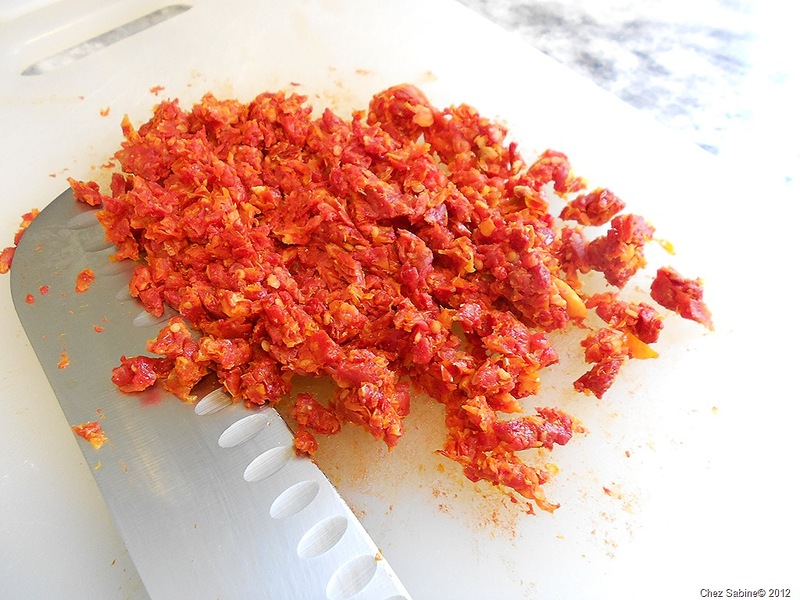 I want you to find sun-dried tomatoes in a package as if they were raisins or dried cranberries or any other dried fruit. I get Trader Joe’s brand because that’s where I know I can find them all of the time. And you’re going to make your own garlic-infused olive oil for the tapenade; you’ll know exactly what you’re getting and you’ll fall in love with this oil. This is my go-to appetizer for last-minute guests. I put the oil in small dipping bowls, splash a little balsamic, grind a bit of black pepper, pinch of salt, big pinch of dried red chilies and sometimes some freshly grated Parmigiano Reggiano. Pour the wine, grab a baguette, slice it thinly, and that’s it. Dip away. I confess that’s also been dinner on more than one occasion. Note that all oil and fresh garlic mixtures should be consumed within a day or so of preparation, and should always be refrigerated. Several years back, the FDA warned of combining oil and fresh garlic and leaving it around for a while. 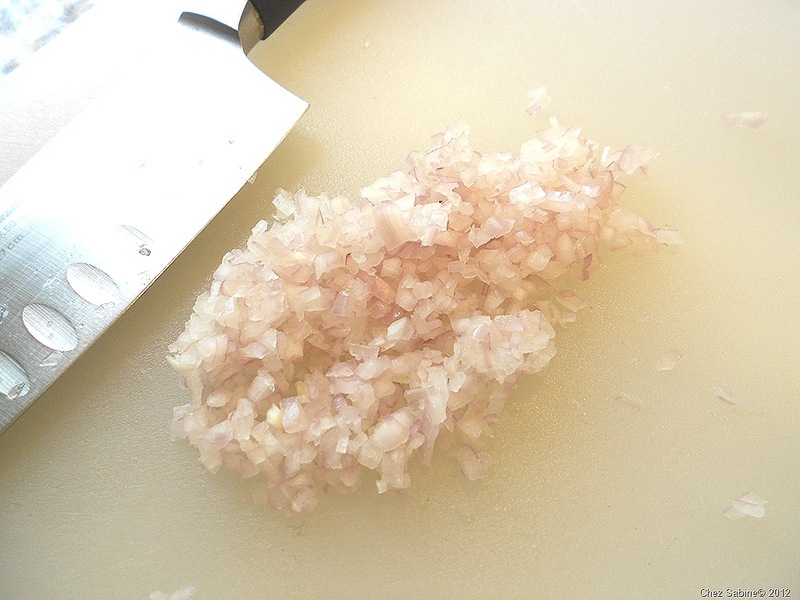 The garlic’s low acid content could allow for the possible growth of Clostridium botulinum, a bacterium that causes botulism. Yes, you read that correctly — botulism. Blech. OK, on that happy note, let’s make some tapenade. The amounts are approximate because, ultimately, you’ll flavor it to your taste. 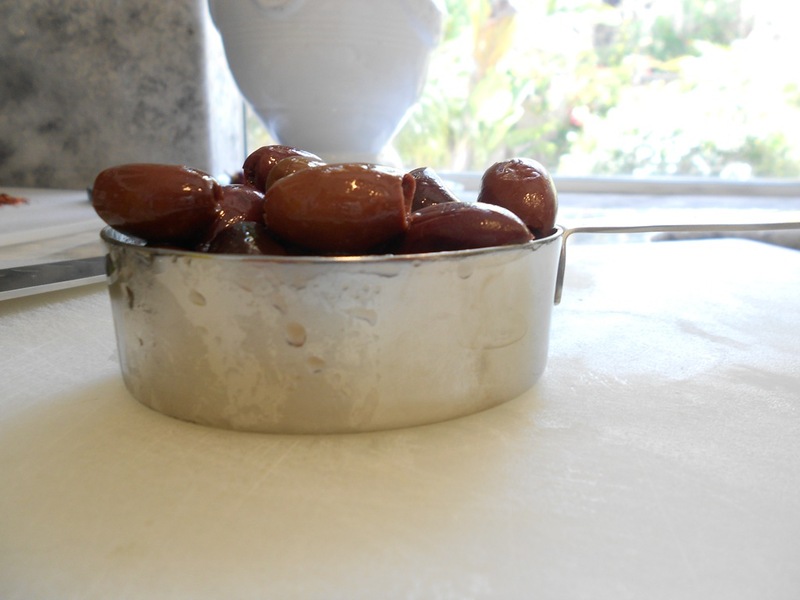 Crush the 3 garlic cloves in 1/4-cup olive oil and microwave it for 45 seconds for perfectly and quickly infused oil. This is so easy that there’s really no reason not to make garlic oil fresh each time you need it. 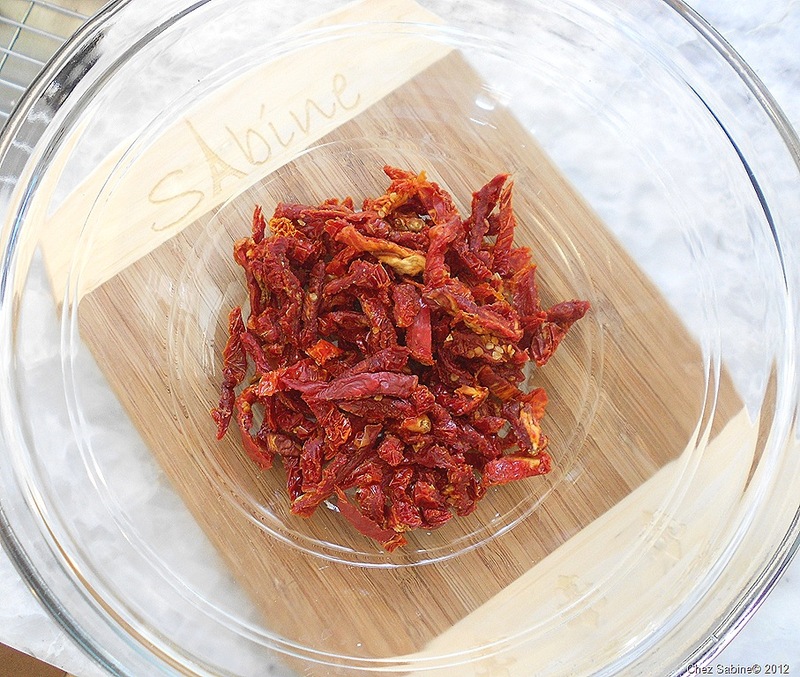 Place the dried tomatoes in a heat-proof dish and cover them with 2 cups of boiling water. That cool bamboo cutting board was a gift from a friend who has some magic laser computer wizard thing that makes the most fun gifts. I had her engrave glass pie pans one year to give to another friend who always ended up losing her pans when she took pies for holiday dinners. After soaking for about 10 minutes, your tomatoes will be nice and soft. Time to squish as much water from them as you can. 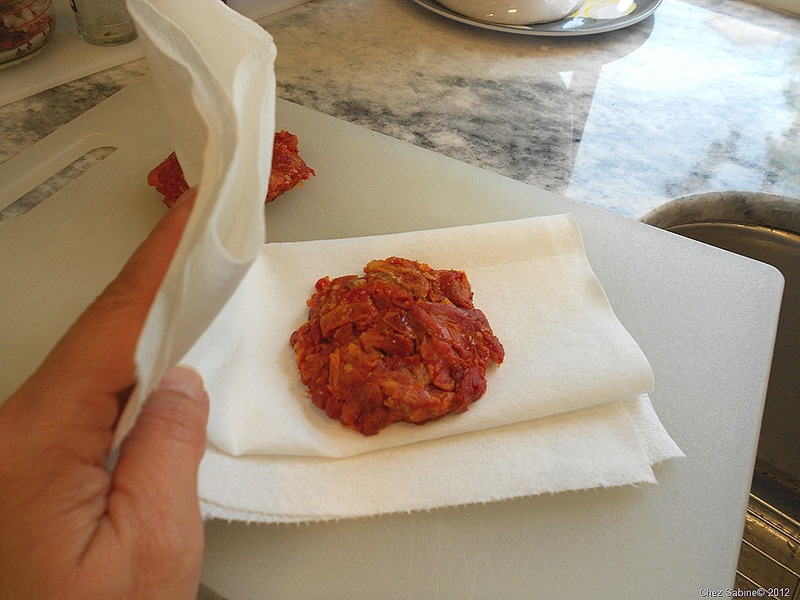 Squeeze them with your hands and you can easily form little patties that make the tomatoes a breeze to chop. Then blot them well with paper towels. Now they’re ready to chop. While I don’t like them pureed, I don’t like the tomato pieces too large, either. 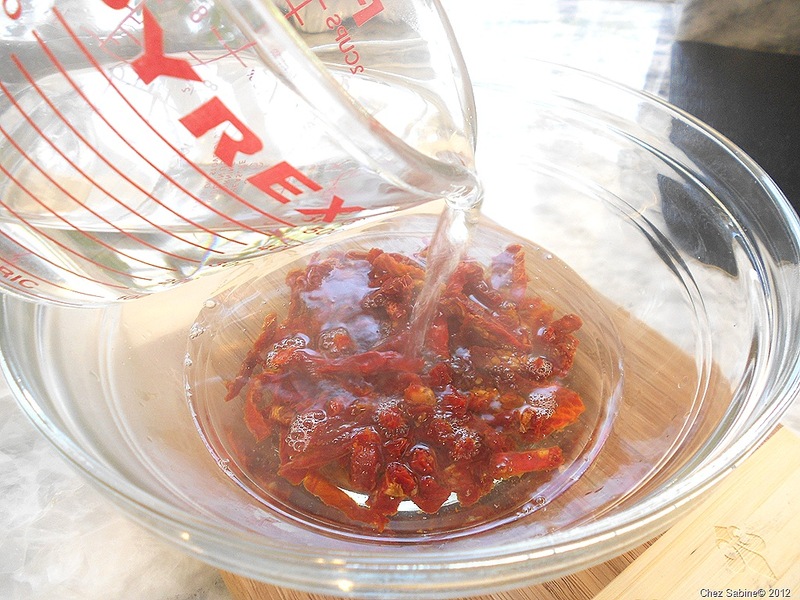 Don’t throw the water in which your dried tomatoes have been soaking. I stash it in the freezer and toss it in stock or use it when I need liquid for a tomato sauce. I like to make my life easy and use kalamata olives that are already pitted, but you still have to make sure that a stray pit isn’t hanging around. I give the olives a nice rough chop. But I like my shallots finely minced. I adore shallots and often use them instead of onions. I especially like them in a classic vinaigrette dressing. 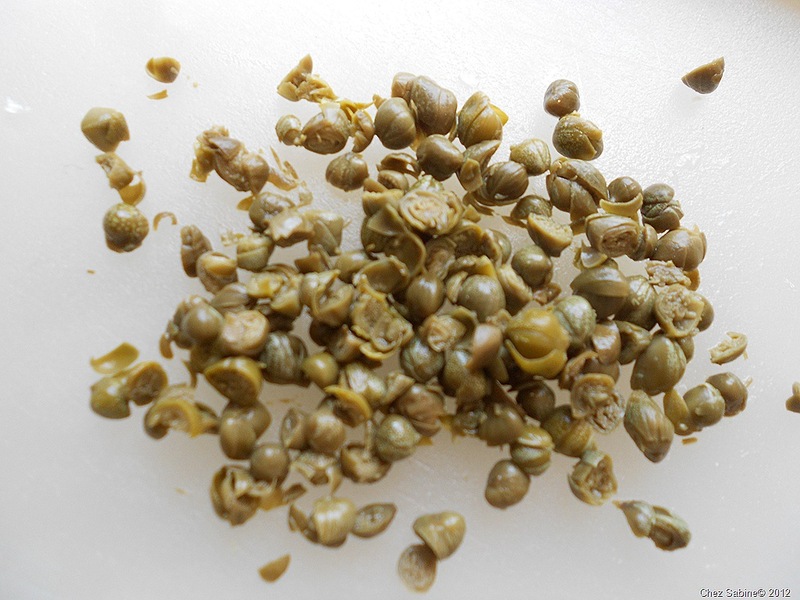 I love capers and I’m seldom without a jar in the fridge. If you like them whole, that’s fine, but I like to run my knife through them about three or four times for this dish. 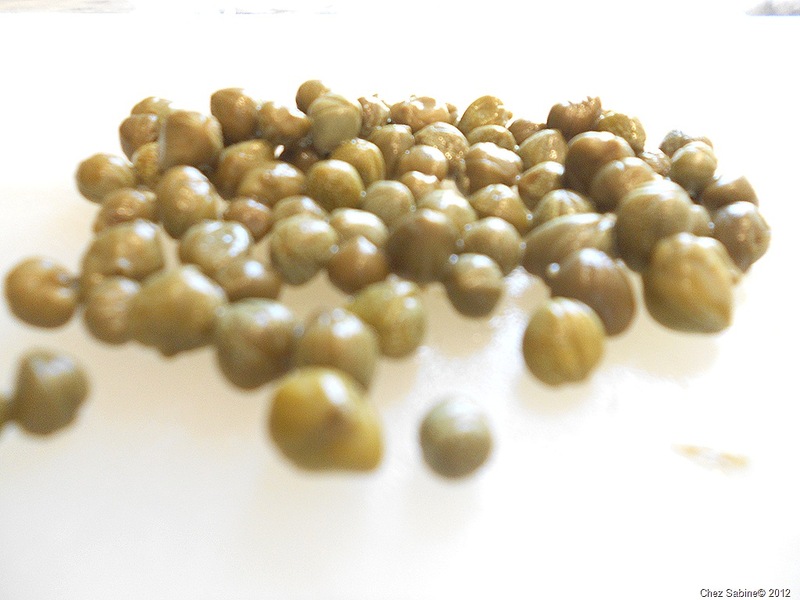 I still want them to be recognized as capers. See? Slightly chopped but still capers through and through. Now, get all of the ingredients except for the oil and vinegar into a bowl. 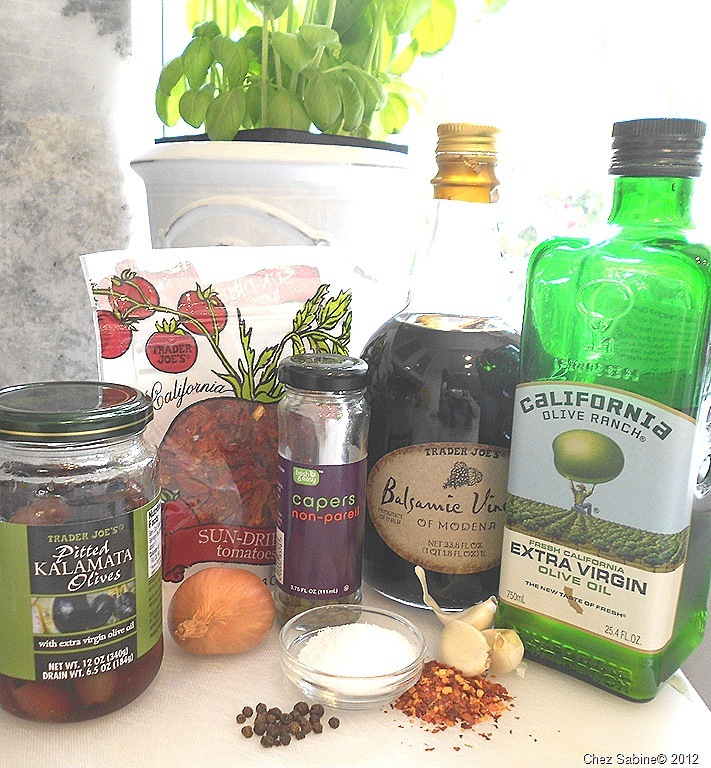 We’re getting ready to conjure up some culinary magic with these bold flavors. Add a couple tablespoons of the garlic-infused olive oil. Now add a big spoonful of balsamic vinegar to the mixture. 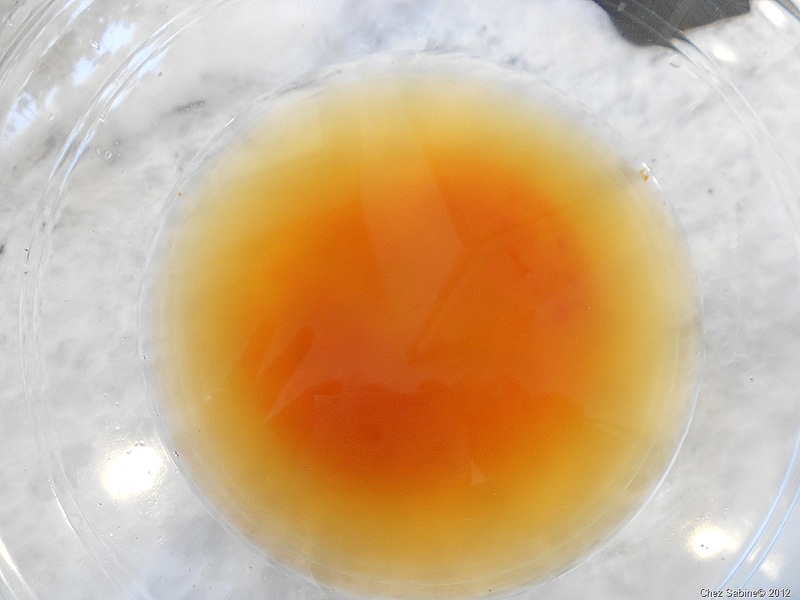 You can use red wine vinegar if you’d rather. 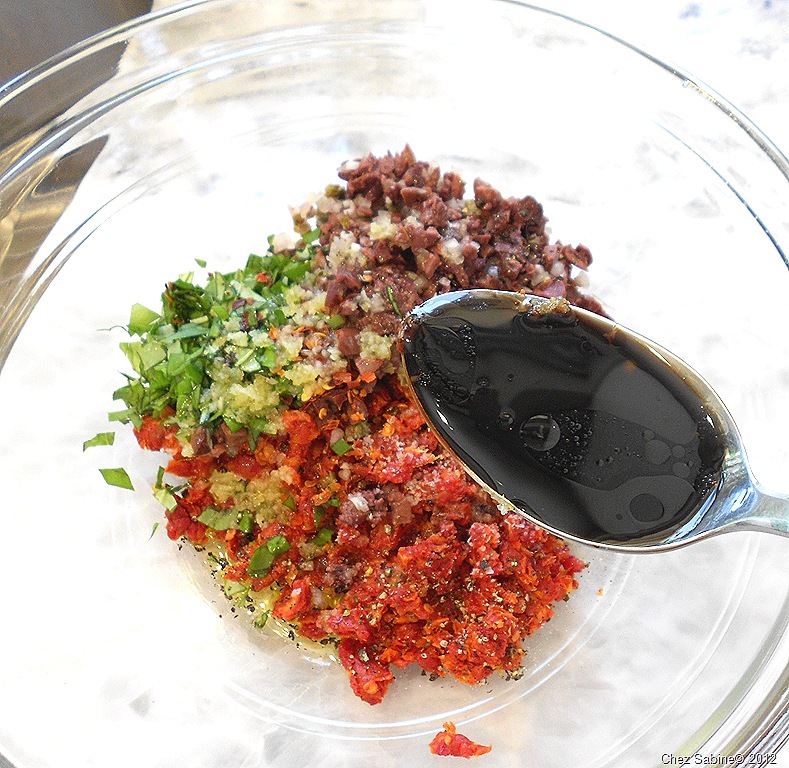 Mix the tapenade well to distribute all of the ingredients. 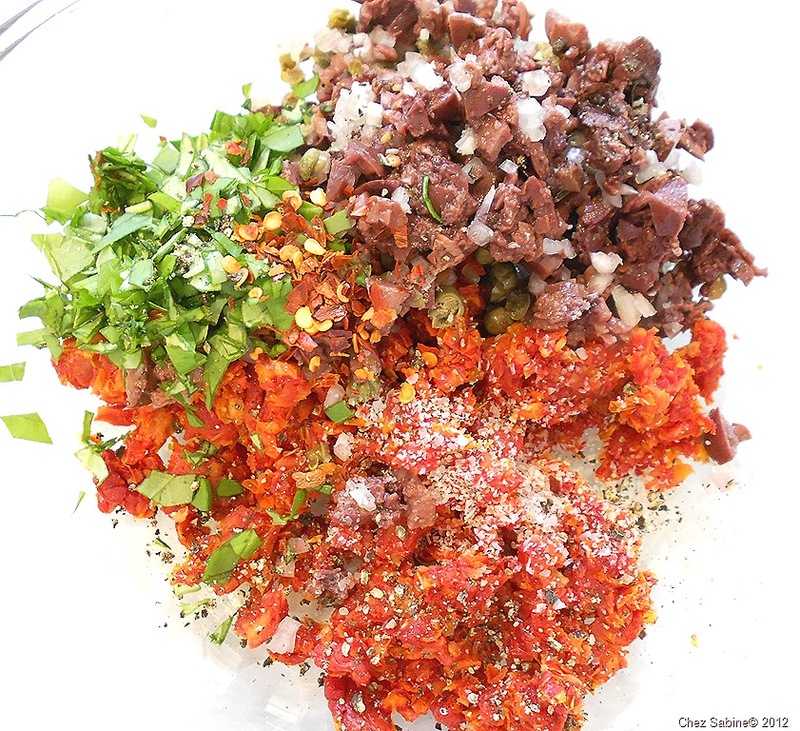 And now is the perfect time to taste it to see if the tapenade needs a smidge more garlic – you can add the oil or just the crushed garlic that’s in the oil – or more hot pepper flakes, salt or pepper. But the flavors will meld as it rests covered in the refrigerator. Don’t limit the tapenade to a spread or dip. Toss some in a marinade for meats or use it instead of tartar sauce for fish. Add a little to a pasta sauce or try it as a seasoning in an omelet filling. 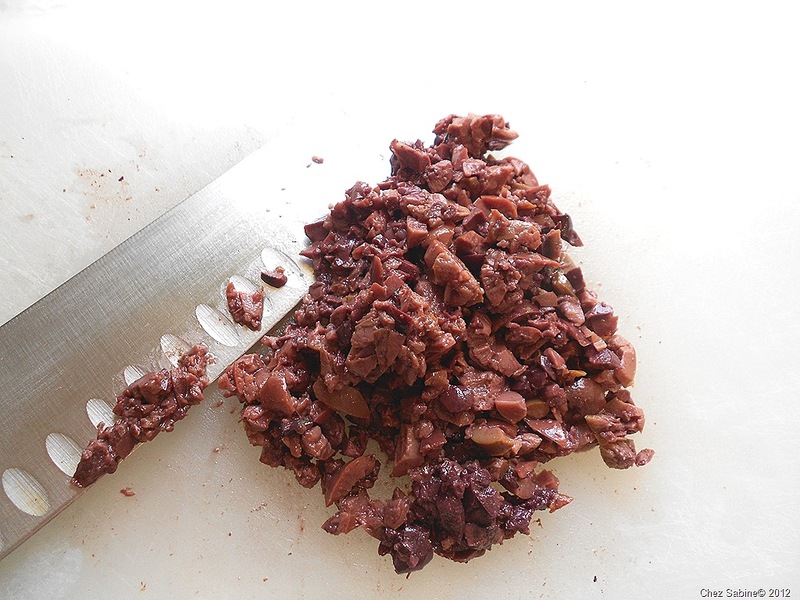 There are a million uses for tapenade. Look at this gorgeous tapenade. It makes me want to lick my monitor. Go make it and tell me how you used it. 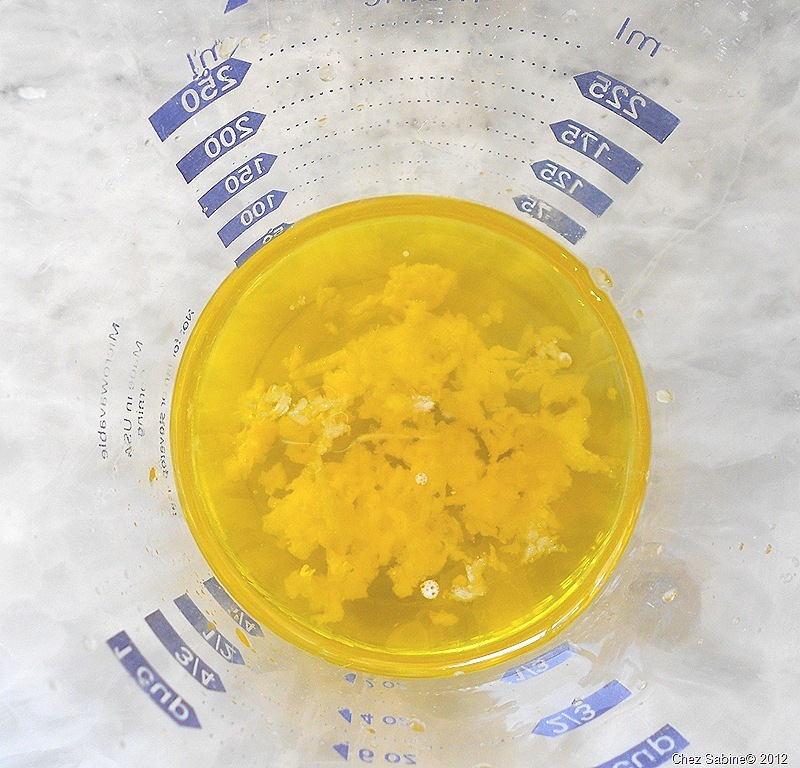 Make the garlic-infused olive oil by crushing the 3 garlic cloves into the oil, which should be in a heat-proof glass measuring cup. Place the oil and garlic in the microwave and heat for about 45 seconds. Remove it from the microwave and set aside. Your kitchen will now smell divine. And then some. And if you don’t have a microwave, then simply heat the olive oil and garlic on low heat in a saucepan, without letting the garlic brown. Meanwhile, bring 2 cups of hot water to a boil, pour it in a heat-proof bowl and add the tomatoes. 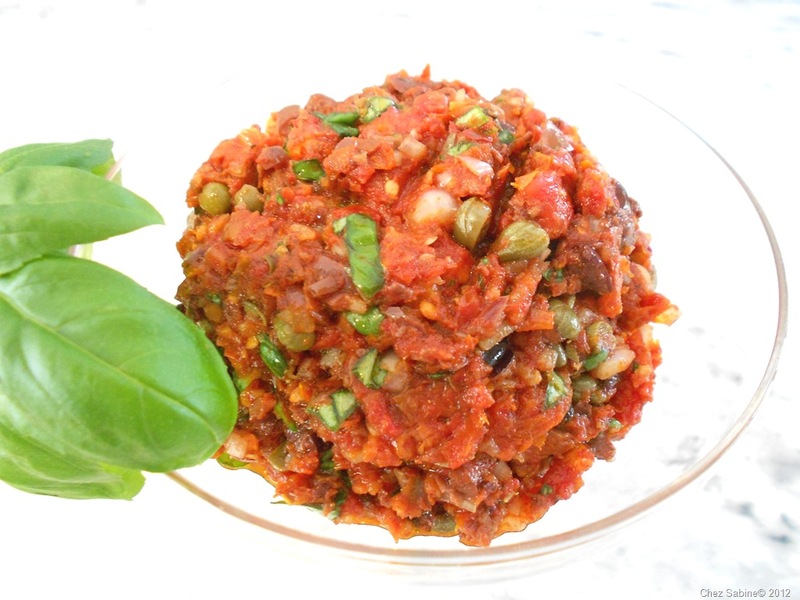 While the sun-dried tomatoes are soaking (for about 10 minutes), start chopping the olives, shallot, capers and basil and set them aside. 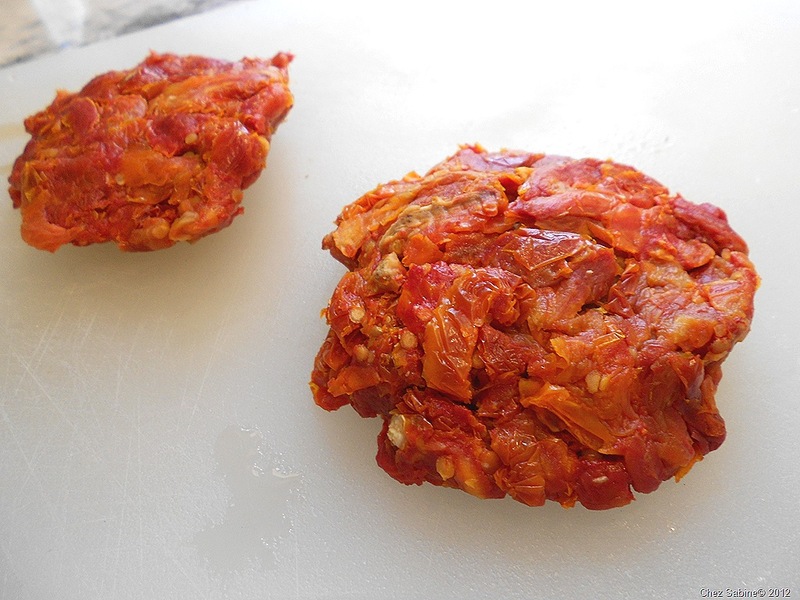 When the tomatoes are soft, wring them out with your hands and shape them to look like a hamburger patty. Blot them well with a paper towel. 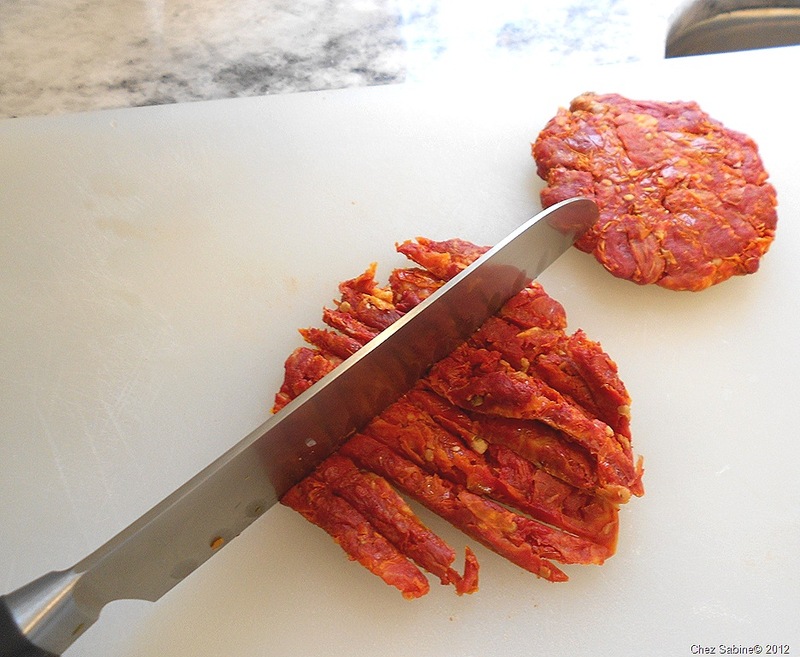 Now they’re easy to chop. Add them to the other chopped ingredients, then add about 2 tablespoons of the infused olive oil, using as much of the crushed garlic as you like, the balsamic, pepper flakes, salt and pepper to taste. Mix well, tasting as you go. Feel free to use more oil if you need more of a garlic punch. I usually do. 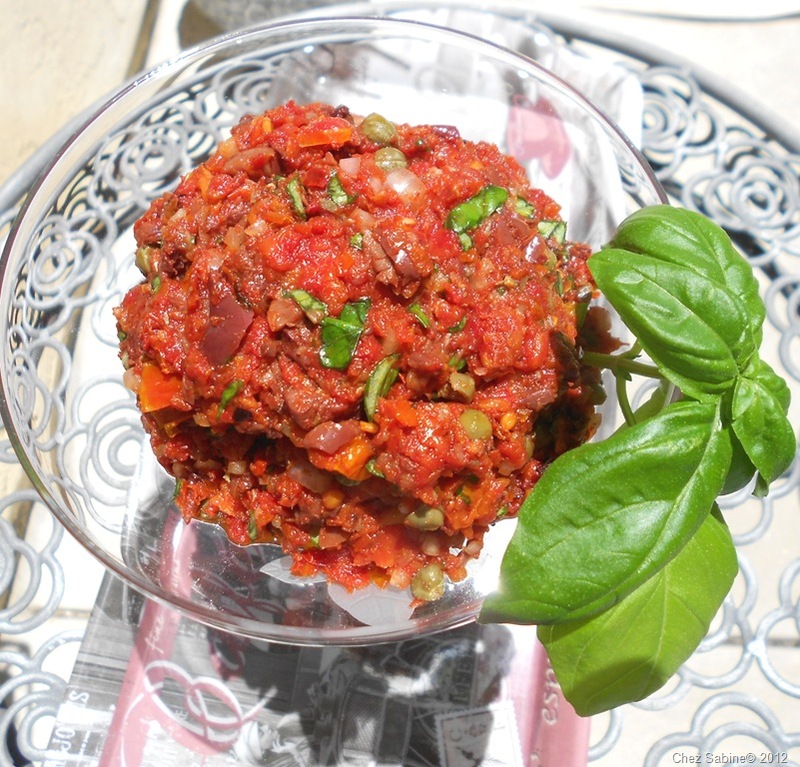 Place the tapenade in a covered dish and refrigerate. It’s good for about three or four days. Makes about 1-and-1/2 cups. Sabine, your food looks delicious! Thank you, Kathy. I hope you get to try this. It’s so easy. And thank you for reading! This looks mouthwatering and Dr. Gundry approved. Hmmm… what to serve it on for Allen?